For about a decade of his young life, he received pituitary growth hormone treatments through a long-running study done at Albany Medical Center. 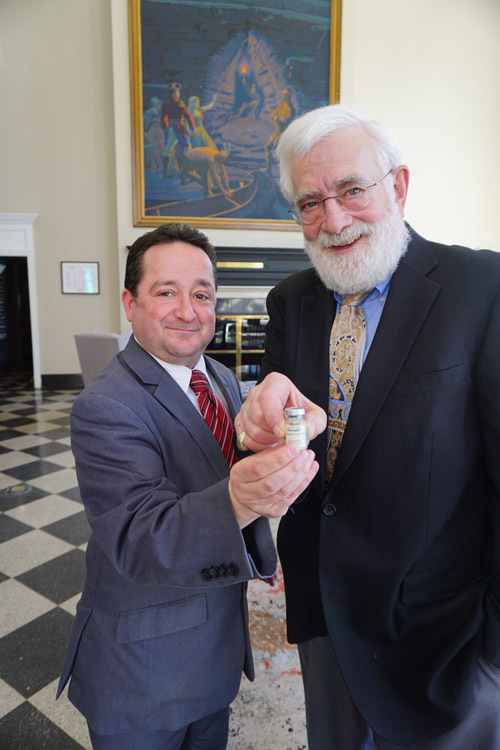 Last week he reunited with the doctor who treated him, Steven Leveston, now of Connecticut, for the day in Glens Falls. It was a slice of Mike’s life, from community meetings and a stop at the Adirondack Broadcasting radio station, to lunch at the Queensbury Hotel, running into friends and admirers all day, ending with the celebration of the Glens Falls High School State basketball champions in City Park, where Mike was deejay, followed by dinner with Dr. Leveston and Mike’s quartet of parents and step-parents. “I think I was about in the first grade when a friend of my mother’s noticed that I was wasn’t growing like the other kids,” Mike recalls. So it was that Mike started a long course on experimental drugs — receiving shots of human growth hormones derived from the pituitary gland of human cadavers. That’s not so unusual, Dr. Leveston tells The Chronicle. The experimental drug was distributed through a specially formed arm of the National Institutes of Health called the Pituitary Network Association, from the late 1950s to 1985. 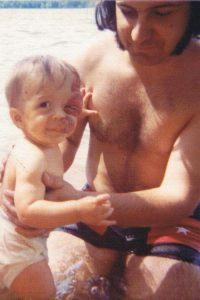 Mike DuBray, with his father — In addition to growth hormone deficiency, he was born with strawberry nevus, a disorder of the blood vessels on the face — and he had a heart condition that required surgery when he was still a toddler. When Mike was born in 1972, he also had a litany of serious medical issues. Besides the growth hormone deficiency that left him notably smaller than his playmates, Mike was born with what’s called “strawberry nevus.” The disorder of the veins caused large, disfiguring red masses around his left eye, mouth and nose. Mike says it took uncountable surgeries and plastic surgery to remove the damaged vessels. He still has the scars, and he’s blind in the one eye. “I also had heart surgery,” he says, at about 18 months old, he and his mother believe, involving a double aorta, removing one that was wrapped around his trachea and inhibiting its function. “I was in and out of hospitals all the time,” Mike says. The diagnostic protocol for growth deficiency included artificially lowering the child’s insulin level — something Dr. Leveston recalls as particularly brutal. Mike only remembers that it was his birthday, and his classmates all sent cards. He does remember the terrifying long needles used to inject the hormones. Check-ups in the hospital loomed large for him — he remembers examinations in rooms full of medical students, more needles for blood draws, X-rays to measure growth plates. Dr. Leveston says the hospital visits were far less frequent, and difficult but less invasive than Mike recalls. “Still, it wasn’t easy,” the doctor says. Through it all, Mike was by all accounts an outgoing, mischievous child. There was the time the kid slipped out of their grasp, ran down the hall to avoid those needles, doctors hot in chase. Or when he was on the hospital’s rooftop lounge with other kids, “doing what kids do,” Mike recalls. What was that? In his case, inciting the other young patients to throw snowballs onto cars below. At school, Mike says he was embraced by his classmates, hung around with the older kids, always, a larger-than-life personality despite the pain, the difficult treatments, the facial disorder and scars that may have separated a less confident child from his peers. From an early age he was fascinated by radio, he says, forging relationships with Albany radio personalities, calling in to the morning shows as a regular contributor while just a kid. Eventually he made his way to the broadcasting program at SUNY Adirondack, then Adirondack Community College. “I never finished the degree,” he says — he had already elbowed his way into a job on-air. The HGH drugs he received were removed from circulation abruptly in 1985 when some patients developed Creuzfeldt-Jakob Disease. Like so-called Mad Cow Disease, Dr. Leveston explains, can lie dormant in the system for up to 30 years before it develops into a fatal, degenerative brain disease. The pharmaceutical industry shifted to a non-cadaver-derived artificial growth hormone. That’s what’s used today to treat growth deficiencies, along with an increasing number of related disorders.